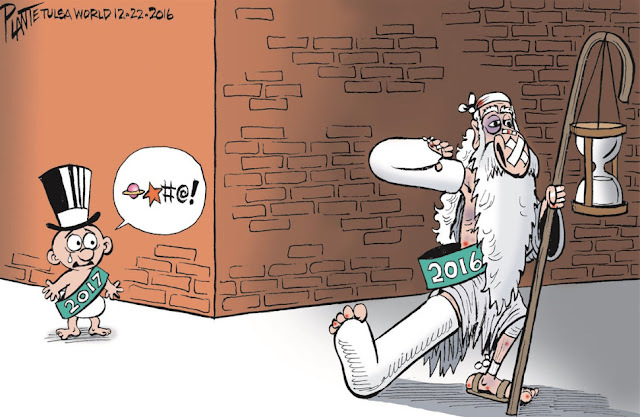 The Hideous Year 2016 and the Last Cheerful Nation. Well the cursed year 2016 is almost over, and like the rest of you I'm rushing off to the year 2017, to try escape the dying old man's murderous scythe. And this will be my last post for a while, because I'm leaving for Montreal in a couple of hours, and I fear I might not be in shape, or sober enough, to write anything for the next few days. But before I go, I want to try to cheer up progressives for the last time this year. By pointing out that even in this grim 2016, there were some things to celebrate. You might think Donald Trump would want to keep his passionate bromance with Vladimir Putin under wraps, or at least under control. Especially after the Obama administration just punished his friend for allegedly trying to help Trump win the election. But yesterday when Putin refused to retaliate. In a head-spinning turn of events on Friday, President Vladimir V. Putin of Russia announced that he would not retaliate against President Obama’s decision to expel Russian diplomats and impose new sanctions — hours after his foreign minister recommended doing just that. Trump just couldn't contain himself. Although it wasn't a very big story, and most Canadians didn't pay it much attention, the Con leadership race was one of the recurring horror stories of 2016. 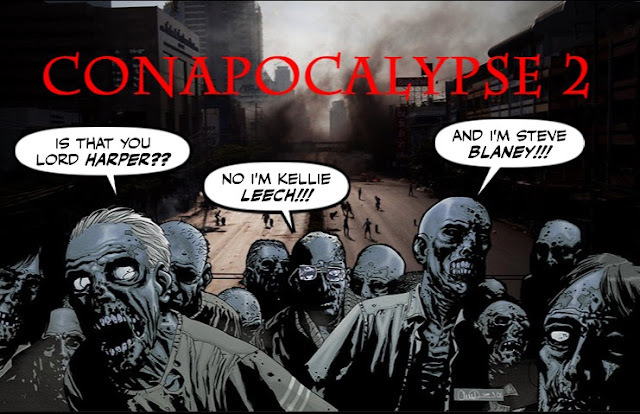 A real zombie apocalypse and a virtual cesspool of bigotry. 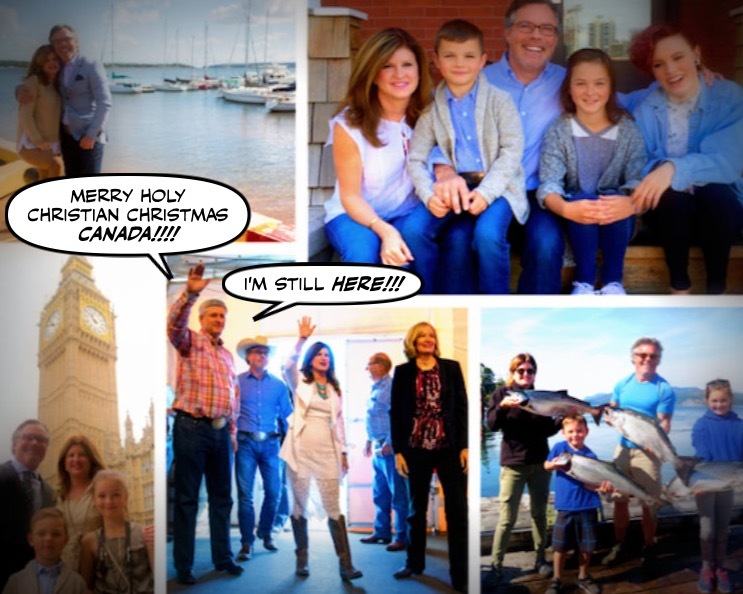 With Kellie Leitch going after immigrants, Brad Trost going after LGBT Canadians, and Rona Ambrose just standing there looking stupid. So who can be surprised that the year should end with the ghastly Steve Blaney, who is both bigoted and stupid, showing us all how low HE can go? In my last post I wondered whether Donald Trump was mentally fit to be president, and how long we had to live before one of his tweets started World War III ? 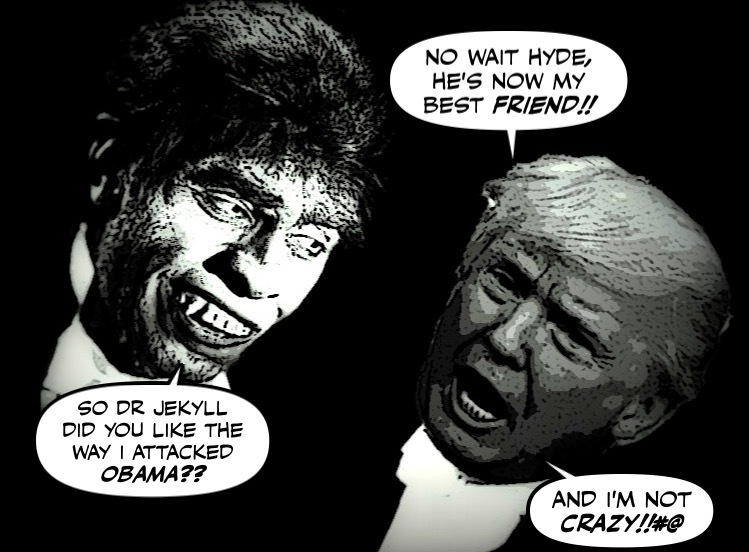 So Trump's Dr Jekyll and Mr Hyde act yesterday was definitely NOT reassuring. President-elect Donald Trump’s transition into the White House is going “very, very smoothly,” he said Wednesday afternoon, hours after complaining on Twitter that President Barack Obama’s “roadblocks” had made for a rough changeover of power. For surely a man prone to such wild mood swings should not be allowed anywhere near the nuclear button. But despite that ominous outlook, there is some good news. 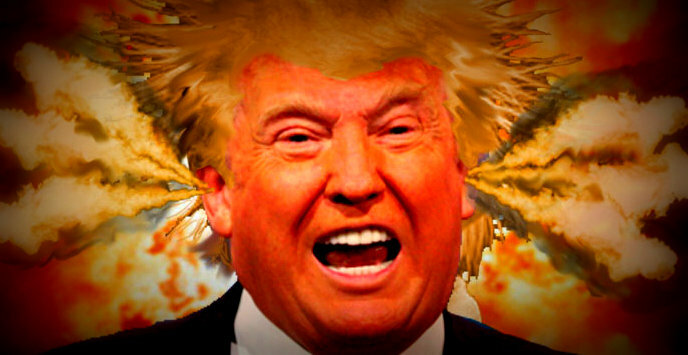 Is Donald Trump Too Deranged To Be President? It's like a slow motion nightmare. Donald Trump is now just 23 days from being sworn in as president, and getting his hands on the nuclear codes. And it seems that the pressure is getting to him. 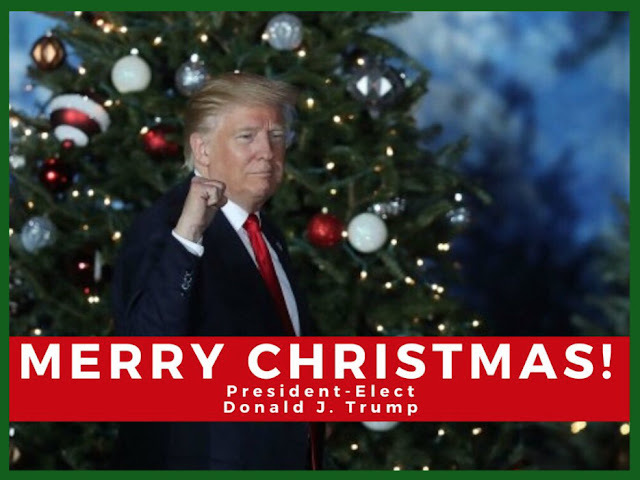 He's in a highly agitated state, his bizarre Christmas card to America was badly received, as I pointed out yesterday. 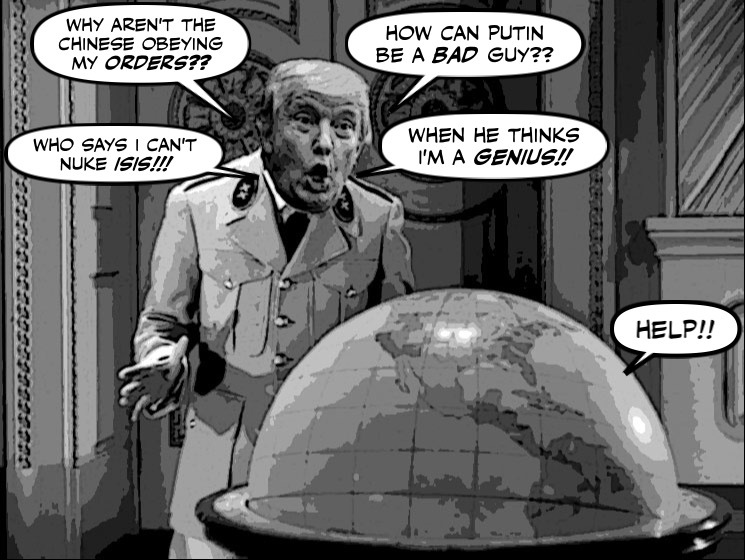 But nobody seems to be asking whether, like the mad emperor who had no clothes, Trump is also is losing his marbles. And is mentally unfit to be president. It has to be one of the most bizarre Christmas cards a president-elect has ever sent the American people. But it does tell you a lot about Donald Trump. 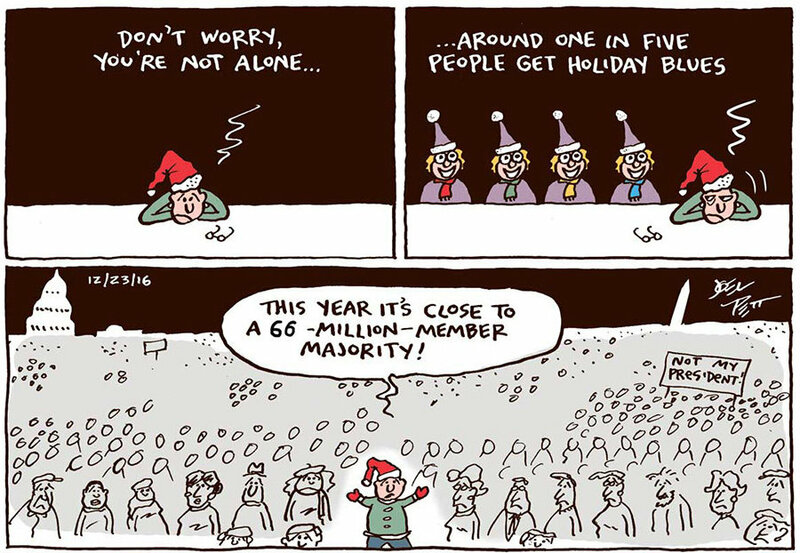 No sense of the occasion or the true meaning of Christmas. No family, not even Ivanka. 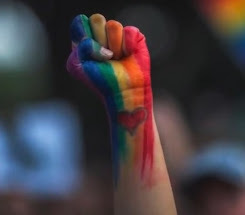 Just HIMSELF, with his tiny fingers curled into a fist. 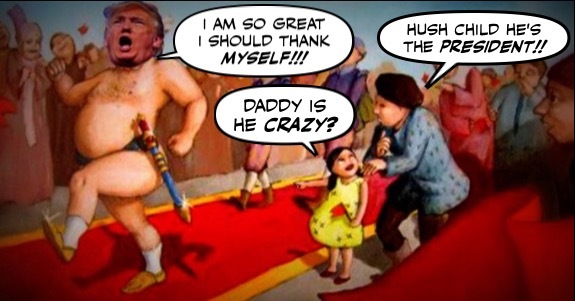 Alone with his delusions of grandeur. While the Republicans scrambled to deny they were comparing him to Jesus. There are only five days to go before the hideous year 2016 limps off the stage. But it still seems determined to prove that it was one of the worst years ever. For not only did it leave us the steaming turd Donald Trump, but it also took so many great artists with it. Leonard Cohen, David Bowie, Prince, and so many others. It announced ahead of time the death of Gord Downie. And now it has also claimed George Michael. It's Christmas Day in Canada, and now that the shopping frenzy is over, and with snow on the ground in the place where I live, the country has never seemed so peaceful and so beautiful. 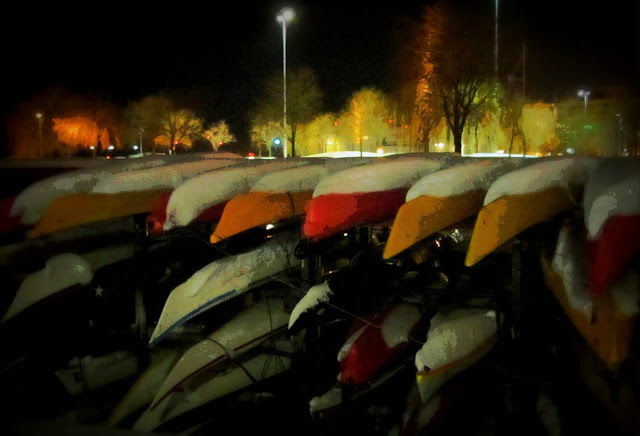 But this year even those colourful lights can't blot out the darkness threatening to envelop us. The darkness of those who would appeal to the worst angels of our nature. And of course the darkness of Trump. 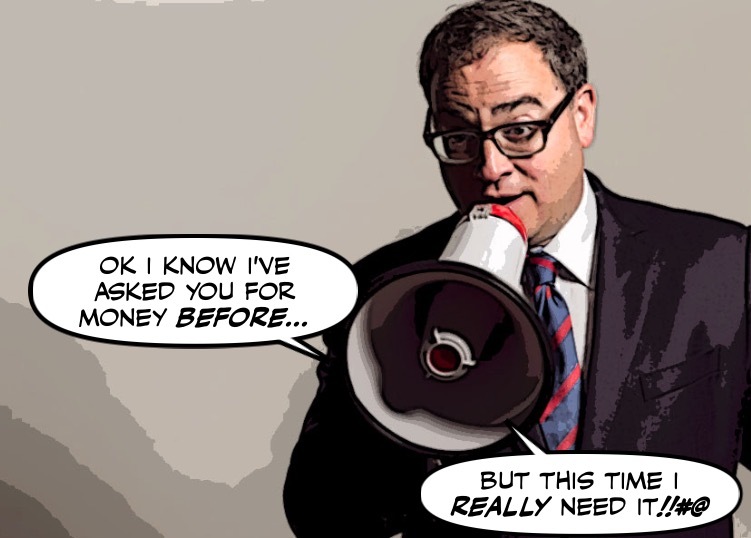 As we all know Ezra Levant spends a lot of his time begging for money. And I mean a lot of time. There isn't a day that goes by that he can't be seen rattling his tin cup, or bellowing through his bullhorn. So I'm sorry to report that his begging is about to become even more deafening. As you can imagine for many progressives in the United States this is not a very happy holiday season. More like the nightmare before and after Christmas. But the good news, or small consolation, is that the ranks of the miserable will soon be swollen by many of Donald Trump's working class supporters. When they finally realize that he has betrayed them, or conned them like suckers. It's a classic Canadian story, or to be more precise, a story that could only happen in Canada eh? 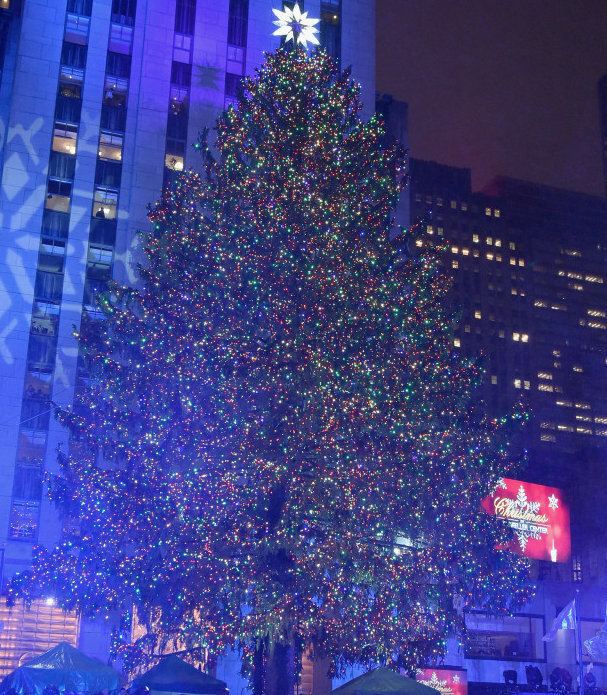 A group of Montrealers set out to get a Christmas tree bigger than the one at New York City's Rockefeller Centre. The one in the picture above. Only to end up with one considerable shorter, and...um...not quite as beautiful. The scariest thing about Donald Trump's government by Twitter is the way his mind wanders, from the important to the trivial. Or from one button to another. One moment he's pressuring Obama to veto an anti-settlement resolution at the United Nations. 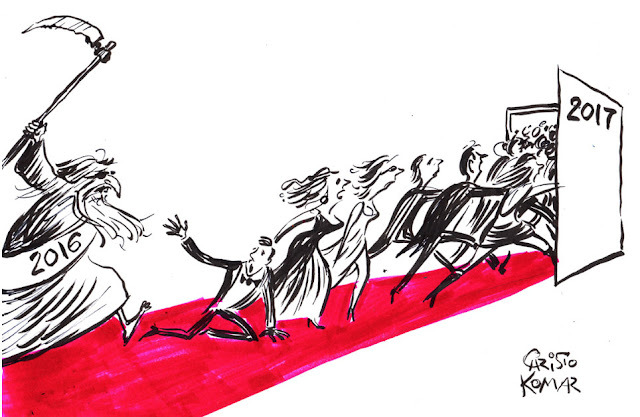 The next moment he's humiliating Newt Gingrich. And then out of the blue he raises the spectre of nuclear war. Of all the horrible things Donald Trump is threatening to do, and there are so many, his promise to end the war against climate change is the worst. For there is no greater threat to the future of humanity, and his claim that climate change is a hoax is not just wrong, it's insane. And if you want to know just how crazy he is, all you have to do is read his angry messages to the former First Minister of Scotland. Donald Trump is less than a month away from being sworn in as president and moving into the White House, but he is reportedly not happy. 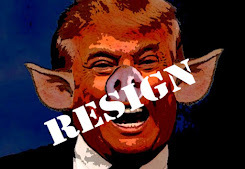 His Thank You Tour is over, he can no longer bathe in the adulation of his fanatical supporters, which he loves to do sooooo much. He is still fuming over Vanity Fair's brutal review of the Trump Tower Grill. And hoping they don't review this one. And to make matters worse his boys are already in trouble, after trying and failing to auction off their sister, and then organizing a very expensive hunting expedition. It wasn't a surprise, but it was depressing, and it was another grim milestone on the way to the darkness of Trumpland. 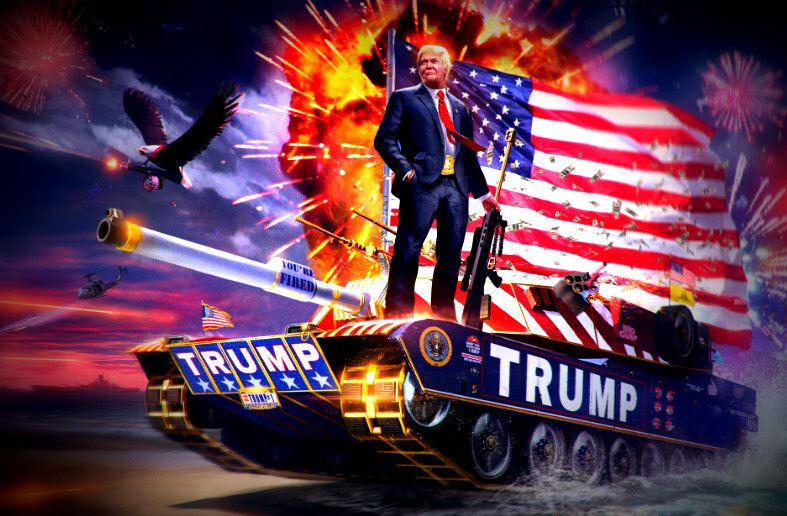 Despite all the e-mails, the petitions, and the protests, Donald Trump is now officially the president in waiting of the United States. There were many protesters but few faithless electors as Donald Trump won the Electoral College vote Monday — ensuring that the businessman will become America's 45th president. And if you want know what kind of president he's going to be, all you have to do is see how Trump reacted in his moment of victory. I must admit I still find it hard to believe that an educated person like Kellie Leitch is doing what she is doing. Or more insane. For what else can you call a member of the elites inciting her own supporters to attack others like her? Or calling on them to undermine the will of Parliament. 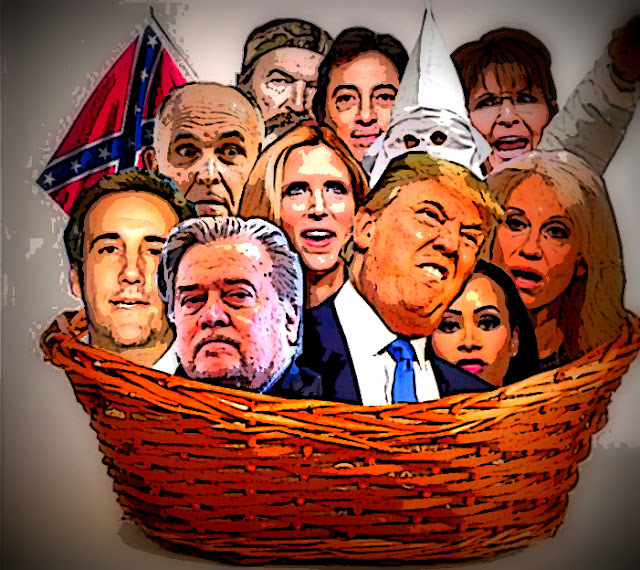 I'm sure you all remember the day Hillary Clinton called some of Donald Trump's supporters a "basket of deplorables"
And I'm sure you remember how Trump howled with outrage, and managed to turn Clinton's comment into a rallying cry. So I'm glad to see that Trump now admits that Clinton was right, and that some of his followers did behave in a deplorable manner. The only thing scarier than thinking about what Donald Trump might do to our neighbours, is thinking what he might do to the planet. Because not only is he planning to torch it, by ending the war on climate change. His foreign policy plans are as dangerous and as crazy as he is. Like so many others I will always remember the year 2016 as an absolute nightmare, an annus horribilis if ever there was one. A year that began promisingly in the still smouldering ruins of Harperland. But ended with a world seeming to spin out of control, the agony of Aleppo, and the horror of Donald Trump. So although I found this Google Year In Search video moving, I don't think it quite captured the nightmare of 2016. 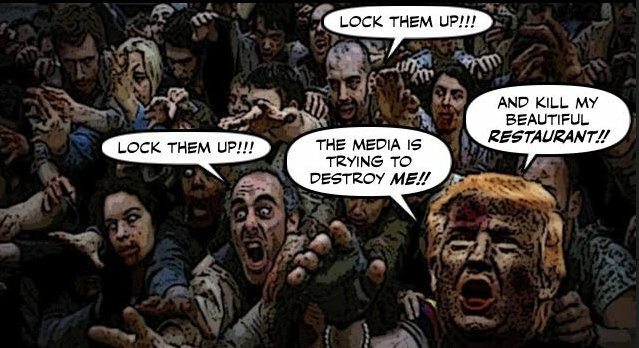 As we all know Donald Trump is always raging about the way the media treats him, the lying media as he likes to call them. And encouraging his 17-million Twitter followers to go after them. 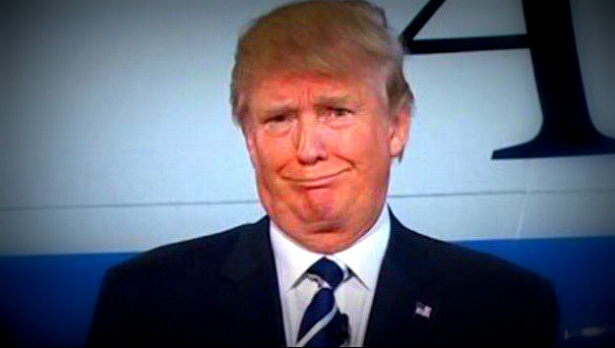 The so-called "three chin Trump." But now he has really gone off the deep end, and is going after Vanity Fair magazine and its distinguished editor Graydon Carter. As we all know, the Con media and the opposition have been having a ball attacking Justin Trudeau and his Liberals for charging people to attend Liberal fundraisers. 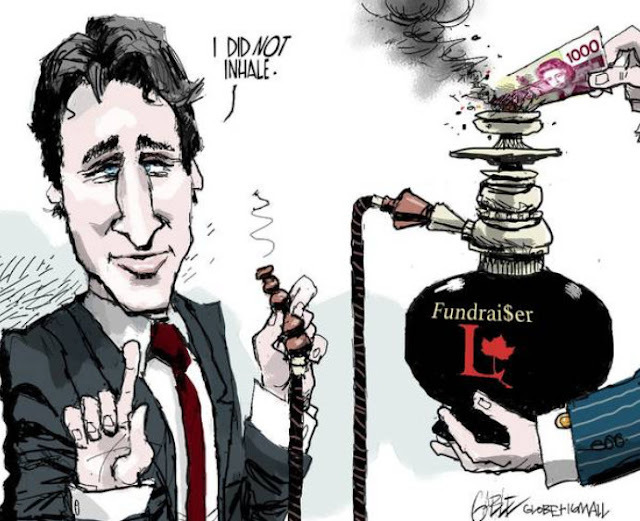 And suggesting that Trudeau could be bought for $1,500 bucks. Even though he has denied that in a manner that seems to me both honest and reasonable. If you put a toga on him he would look like an American Caesar. Donald Trump basking in the warm glow of his inflamed supporters, as he continues his triumphal "Thank You Tour" of his conquered country. 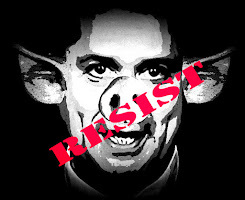 Swaggering around one stage after the other, bragging about how great he is, soaking up the adulation like a sponge, and thunderously declaring that The Resistance has been CRUSHED!!! 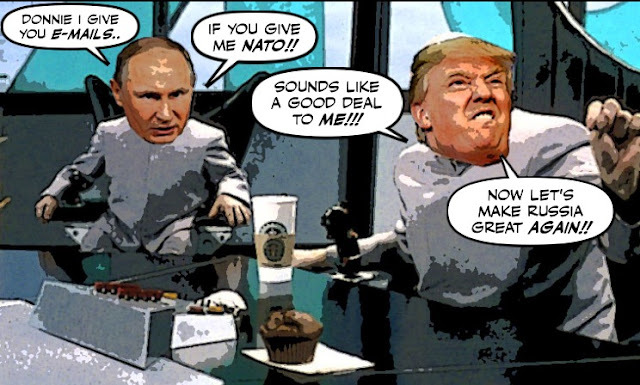 But sadly for Trump, and his plan to turn the U.S. into a militarized kleptocracy, he couldn't be more wrong. I began warning about Canada's opioid abuse epidemic, and about the danger of the killer drug fentanyl, a long long time ago. And about the crying need to create more drug rehabilitation centres, and more frontline medical facilities like Vancouver's model Insite clinic. So I'm glad to see that the Liberal government is taking action. But I also want to remind people, that thousands of Canadians have died from drug overdoses since I first started writing about the problem. And remind them who I believe deserves most of the blame for the deaths of so many. 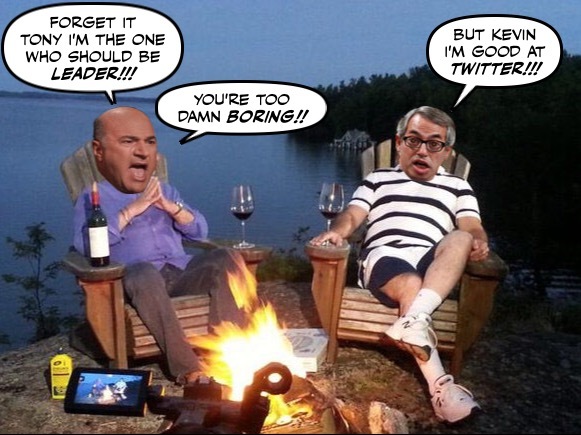 Ever since Kevin O'Leary's infamous "Summit Meeting" with Tony Clement, I've been sure that O'Leary would end up running for Con leader. He knows a third-rate Shark Tank when he sees one. It's been seven months since the wildfire they called "The Beast" came roaring out of the woods and threatened to consume Fort McMurray. 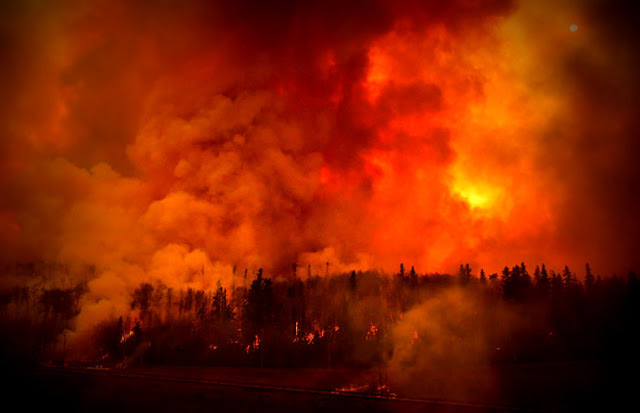 It was Canada's biggest story of the year, and the costliest disaster in Canadian history. And who can forget what a hellish beast it was? Is It Time To Take a Break from Social Media? I must admit I've been finding to hard to blog or tweet or do anything on social media these days. It's just getting too crazy out there. 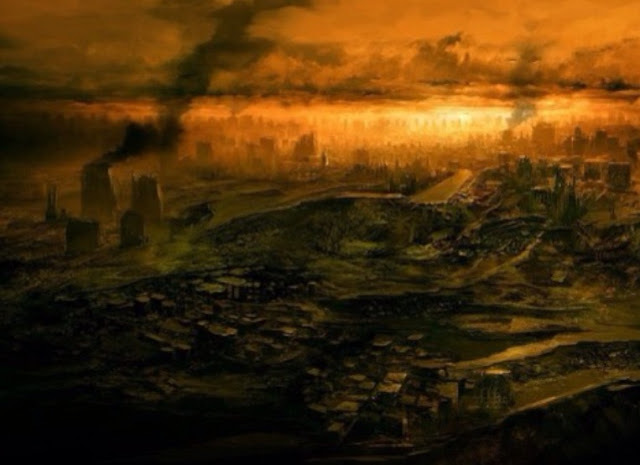 The blogosphere is too gloomy, Twitter is a smoking battlefield. And it's hard to make people laugh as I like to do, when so many of the people I know are either in a deep depression, or angry, or terrified by what might lie ahead. 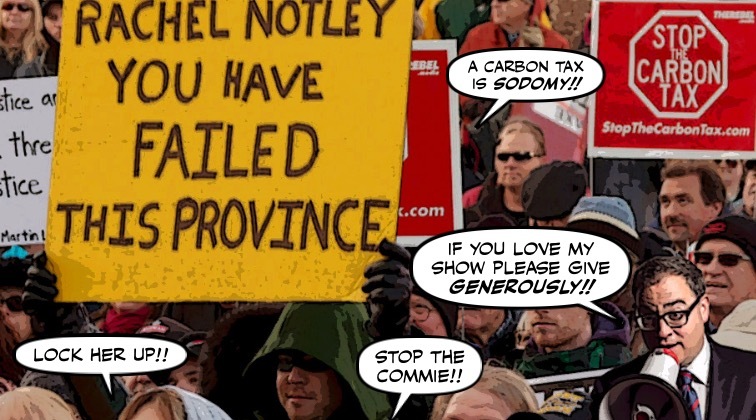 When Ezra Levant organized an anti-carbon tax rally on the steps of the Alberta legislature last Sunday, he was no doubt hoping it would make him a force to be reckoned with in that province, and a ton of money. But as we all know it all went horribly wrong, when Chris Alexander managed to inflame the Rebel mob into chanting "lock her up, lock her up." 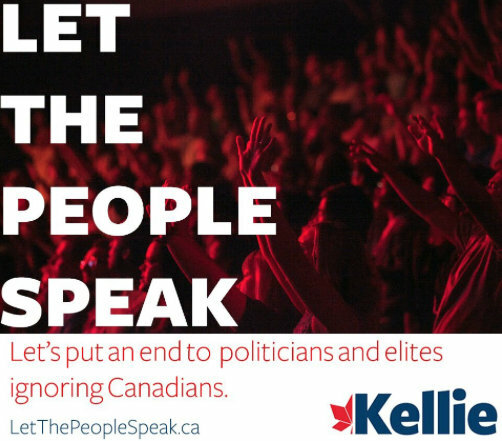 And Levant's ugly rally was condemned by decent people all over Canada. So now the self styled "Rebel Commander" is furious. 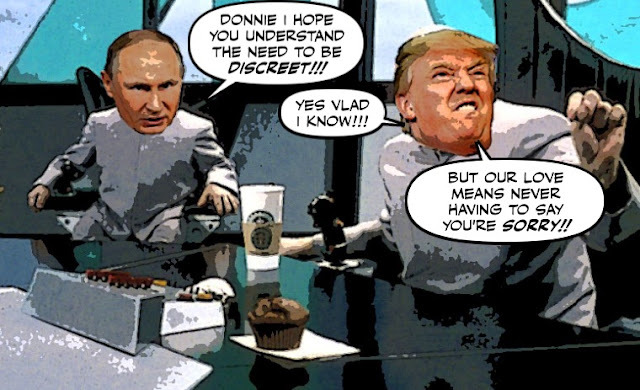 We already knew that a small legion of Russian hackers had intervened in the U.S. election, hacking e-mails, and spreading fake news stories. And we knew that Vladimir Putin would not be displeased to see the U.S. descend into chaos. Which is what most experts believe the Russians were trying to do. 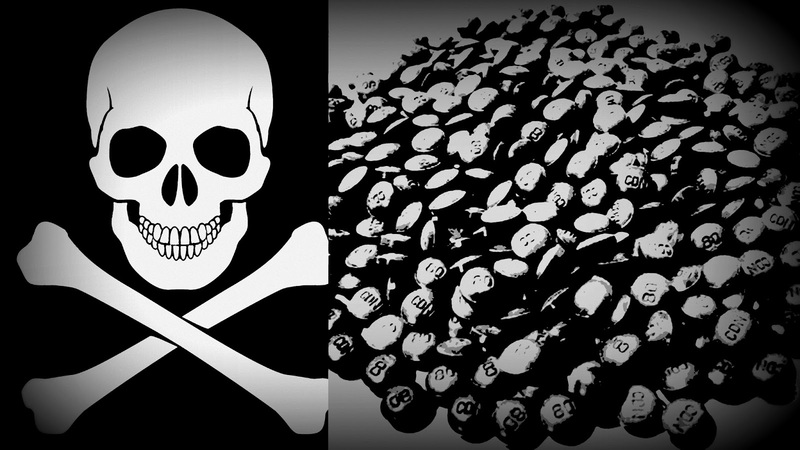 But if this new report is true, their motives were far more sinister. 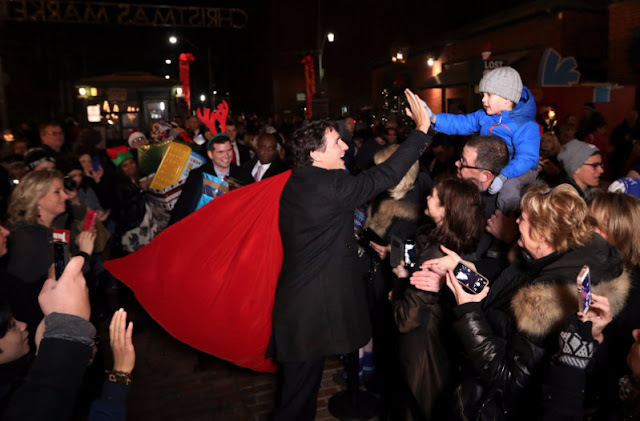 Ever since Justin Trudeau was sworn in as Prime Minister, the Con media has been declaring that his political honeymoon is over. And in recent weeks with the confusion over electoral reform, and the controversial pipeline decision, that clamour has become almost deafening. With one story after the other declaring that his golden ride was finally over. But sadly for the Con media it seems they couldn't be more wrong. It's Time Magazine's ugliest Person of the Year cover since it awarded Adolf Hitler that dubious honour. And Donald Trump is reported to be conflicted. On the one hand his massive all consuming ego is flattered, or inflated further. On the other hand he's furious that anybody should call him a "divider." 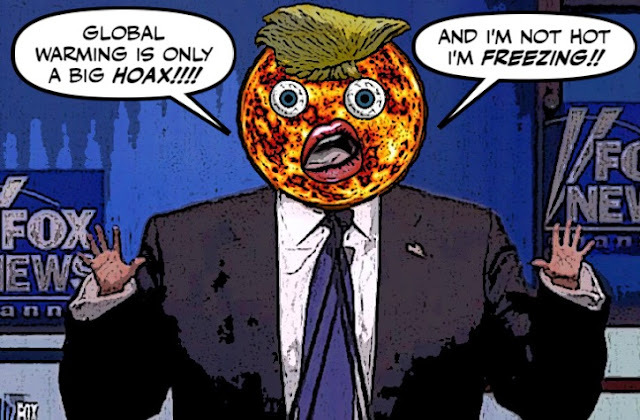 Everybody knew that Donald Trump was a climate change denier, a man who believes that global warming is a hoax. But still the flaming orange got elected, and now we're all going to burn with him. 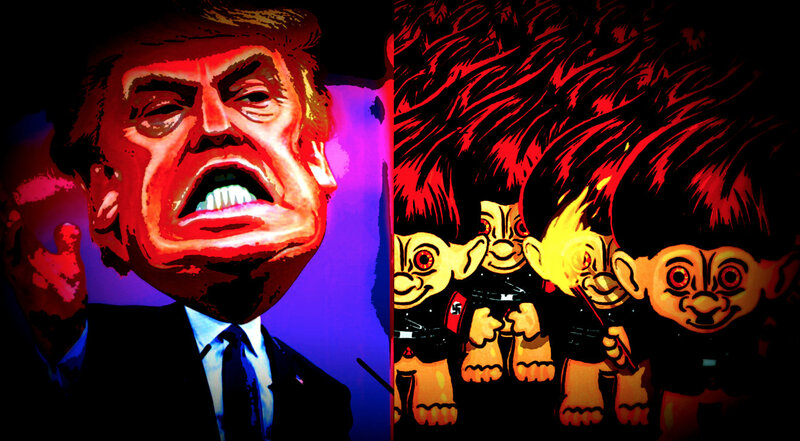 Donald Trump had an army of trolls working for him during the election, spreading fake stories, and flaming his opponents. So it was quite a shock to see him fire one of them. 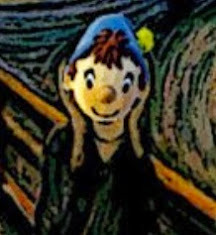 And no ordinary troll either. 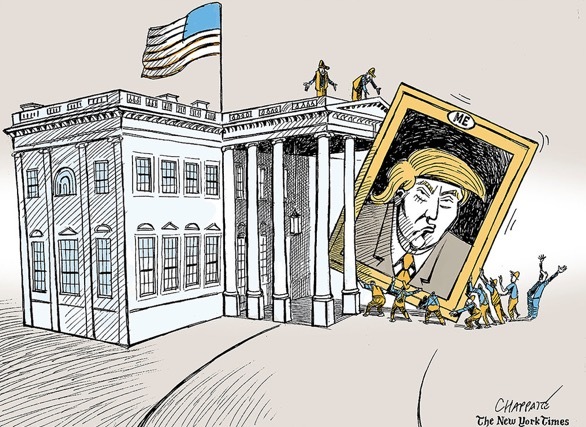 A member of his own transition team. 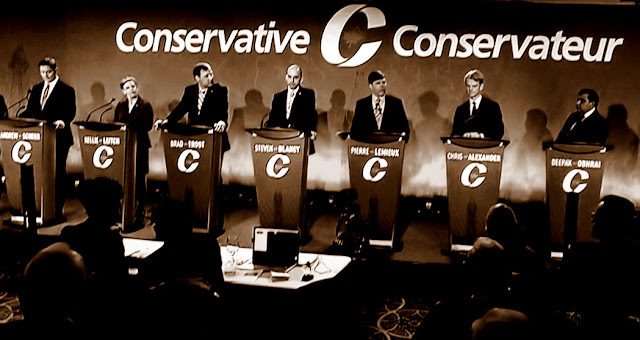 There were so many candidates at last night's Con leadership debate I couldn't fit them all into the picture. Or shake the image of a bunch of crows lined up on a humming power line. But although most of the debate was so boring I had to remember to keep breathing, near the end the feathers or the sparks started flying. It took a while to get interesting, but sparks eventually flew in the second official Conservative leadership debate in Moncton Tuesday evening: there were accusations of race-baiting and Trump-aping, an indictment of the media elite, a lot of bad French and even a promise to eliminate the corporate income tax altogether. And sadly for the Cons, some crows were louder than others. 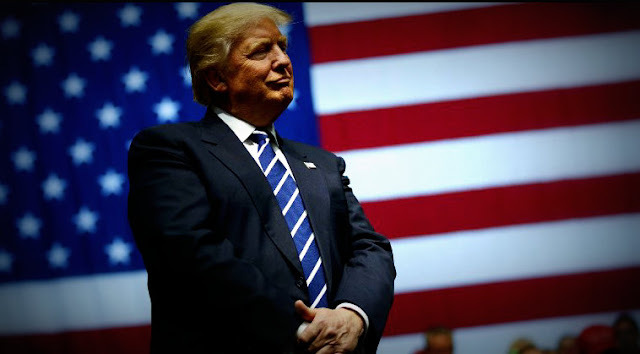 I had just finished my last post, about Donald Trump's plans to all but eliminate gun controls in the United States. 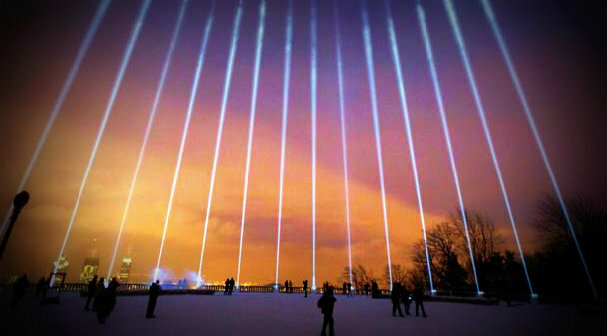 When I suddenly remembered that tonight fourteen beams of light will rise into the sky from the summit of Mount Royal, so all Montrealers can see them. And remember what happened on a snowy day in that city twenty-seven years ago today. When a man who hated women went on a bloody rampage at the École Polytechnique. It's going to a bleak holiday season for millions of Americans who still can't quite believe that Donald Trump is their president. 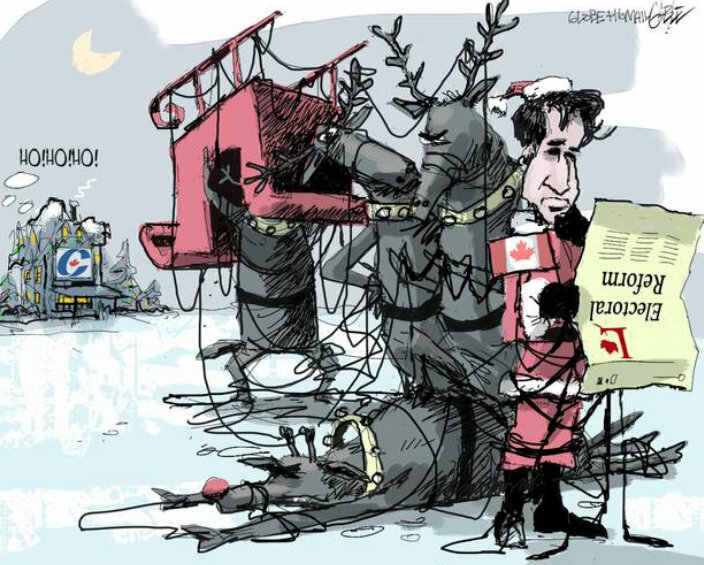 Just like we Canadians can't believe that's really Santa. 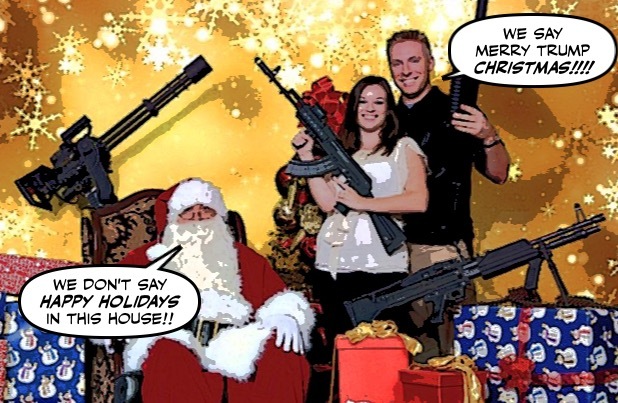 But of course Trump supporters will be celebrating, and so will the National Rifle Association. Because they're hoping that he will be bringing them the best present EVER. 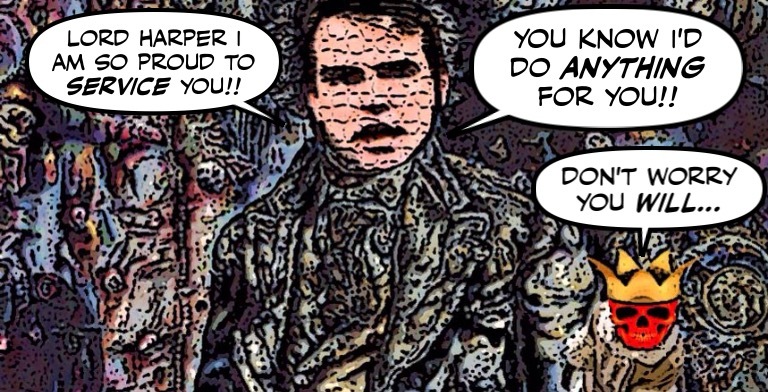 As you may know, the story of Chris Alexander has always reminded me of the Oscar Wilde story The Picture of Dorian Gray. Where the portrait of the once promising young diplomat morphs into something monstrous, after he sells his soul to Stephen Harper. Well yesterday that portrait became even uglier, if that's possible. After Alexander disgraced himself again. 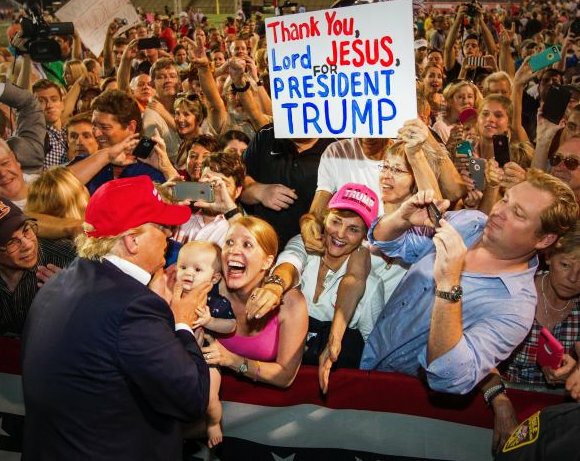 I used to stare at those pictures of Donald Trump preaching to his white working class supporters, and wonder how that old con artist managed to fool so many of them. 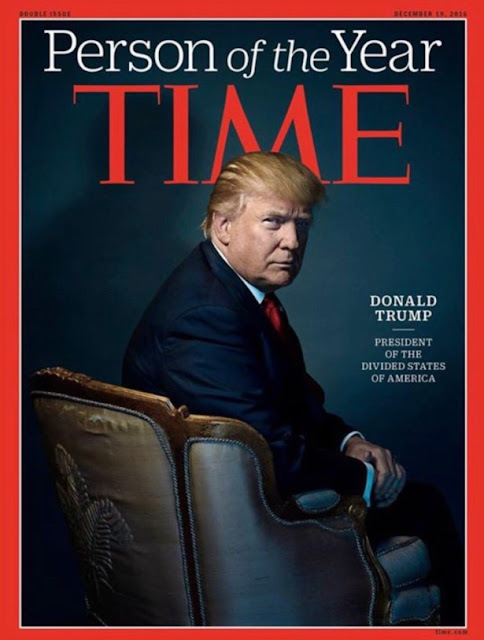 Make them believe that a billionaire who sits on a gold plated toilet seat was on THEIR side. And that he would bring back their lost jobs, fight the elites and the special interests, go after the Big Banks, and Make America Great Again. I didn't believe a word he said, but his faithful followers did, and now they're already looking like suckers. 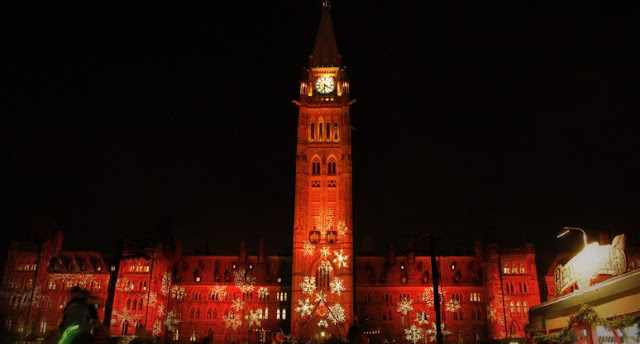 Well now that it's starting to look a lot like Christmas, even in Ottawa. And now that the party leaders have sent out their seasonal greetings. I thought I'd take a break from the grim world of politics, and the horror of Harper and Trump. And get into the spirit of the holiday season. The other night Justin Trudeau turned up at an event in Toronto's Distillery District, bearing a bag of gifts to add to a so-called Toy Mountain for poor children. And I was amazed to see how cheerful and relaxed he looked, after the barrage of criticism he has had to endure in the last two weeks. With the Cons and the right-wing media going after him like rabid hyenas, for calling Fidel Castro a "remarkable leader." And some progressives blasting him for his pipelines decision, and even calling him another Harper. 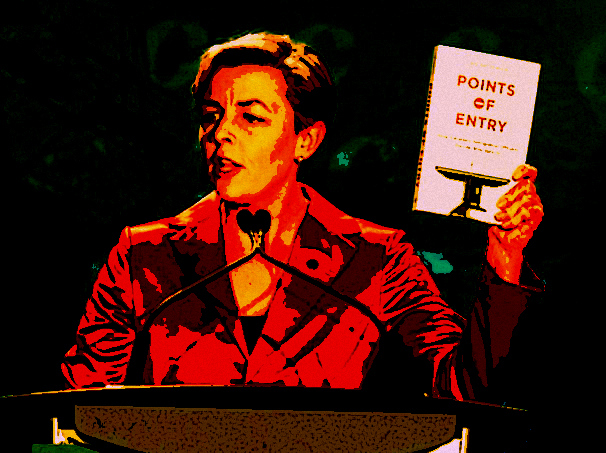 Has Kellie Leitch Finally Lost Her Marbles? It's always been a bizarre cabaret act, a real freak show. 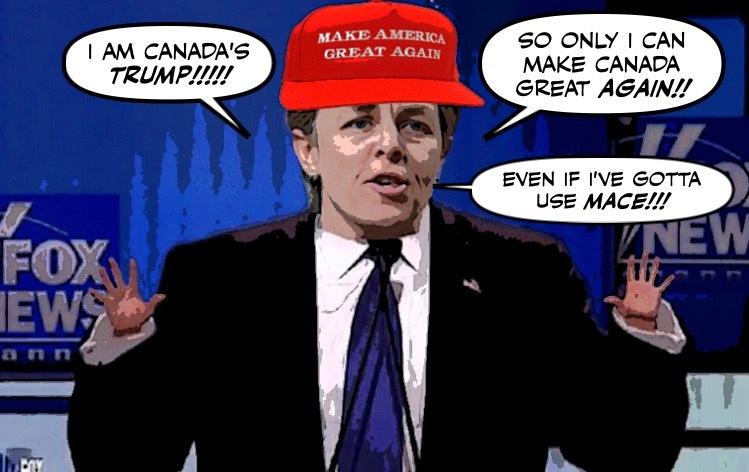 Kellie Leitch's squeaky voiced imitation of Donald Trump, and her xenophobic campaign to make us believe that only she can defend our Canadian values. Even as she disgraces them. But now that ghastly drag show is becoming even weirder, with Leitch claiming that the "liberal elites" are calling her supporters deplorables. Are Russian Hackers Going After Donald Trump's Enemies? As you know Russian hackers are widely believed to have interfered in the U.S. election, by getting their hands on Democratic Party e-mails. And helping to spread fake stories like this one. Now the Germans are worried those hackers could disrupt their election. And to make matters even worse, Keith Olbermann is now accusing them of targeting him, and others who dare to criticize Donald Trump. 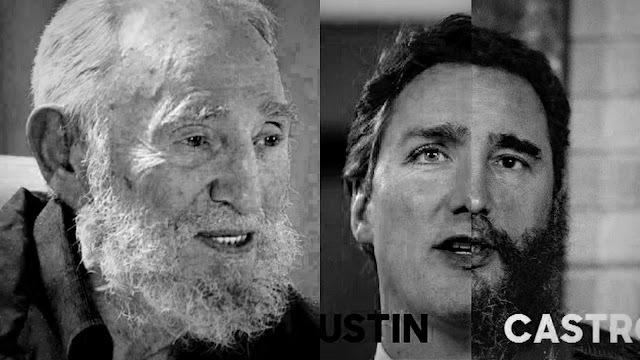 I wasn't planning to write another post about the death of Fidel Castro, and the ugly way the Cons and the Con media went after Justin Trudeau for daring to eulogize him. I thought I had said everything I wanted to say here. But then I saw that even though it's been six days since Trudeau delivered that eulogy, and even though he has announced that he won't be attending Castro's funeral. The depraved Con propaganda machine is still going after him.